Robert Luff & Co are pleased to present this two bedroom detached chalet house in South Ferring. The property is located 0.2 miles from the beach and is close to local shops, doctors and bus links. Ocean Drive provides spacious living, a low maintenance garden, and is offered for sale with no ongoing chain. Parque flooring, double panelled radiator, storage cupboard, textured and coved ceiling. Two double glazed windows giving double aspect, two double panelled radiators, parque flooring, wall light point, fireplace, textured and coved ceiling, storage cupboard, TV point. Double glazed conservatory with pitched roof, door to garden. Measurements to include built in units. Matching range of floor and wall units with work top surfaces and inset one and half bowl single drainer sink unit with mixer tap over, part tiled walls, plumbing and space for washing machine, built in hob, double oven and extractor, radiator, double glazed window, textured ceiling, floor mounted central heating boiler, door to outside. P shaped bath with wall mounted shower and screen, pedestal wash hand basin, low-level W.C, tiled walls and floor, obscured double glazed window, textured and coved ceiling. Access to loft space via pull down ladder, airing cupboard with fully lagged hot water cylinder, radiator, eaves cupboard, textured ceiling. Measurements not to include built in wardrobes. Comprehensive range of wardrobes providing hanging and storage, some with mirror fronted doors, radiator, double glazed window, textured and coved ceiling. Double glazed window, radiator, textured and coved ceiling, eaves access and storage. 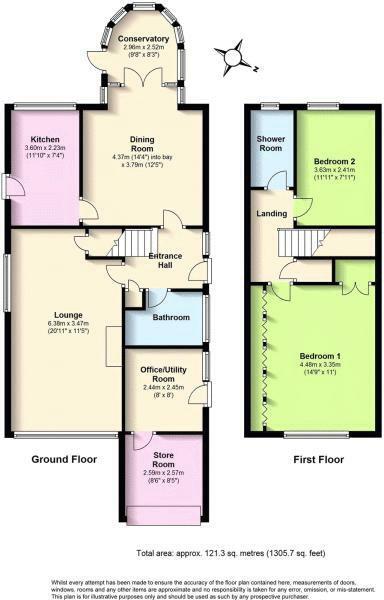 White suite with double shower cubicle and wall mounted shower, low-level W.C, chrome heated towel rail, tiled walls, obscured double glazed window, wash hand basin with mixer tap and cupboard below. Mainly laid to shingle, access to rear garden by the side. Plumbing and space for washing machine, power and light, wall mounted cupboards with electric circuit board and fuse box, personal door to outside. West facing being mainly paved with flower and shrub borders, seating area.